Dr. Dhanya Dharmapalan From Apollo Hospitals Creates a National Record for Becoming the ?Youngest Editor of Pediatric Books? In a first, a pediatric doctor has entered the India Book of Records for becoming the youngest editor of Pediatric books in the country. Dr. Dhanya Dharmapalan, Pediatrics & Infectious Disease Consultant set the record by editing the book titled ‘IAP Colour Atlas of Pediatrics, 1st Edition’ at the age of 32 years. Dr. Dharmapalan has till date edited 13 pediatric books with the launch of book titled ‘IAP Textbook of Pediatrics, 7th Edition’. 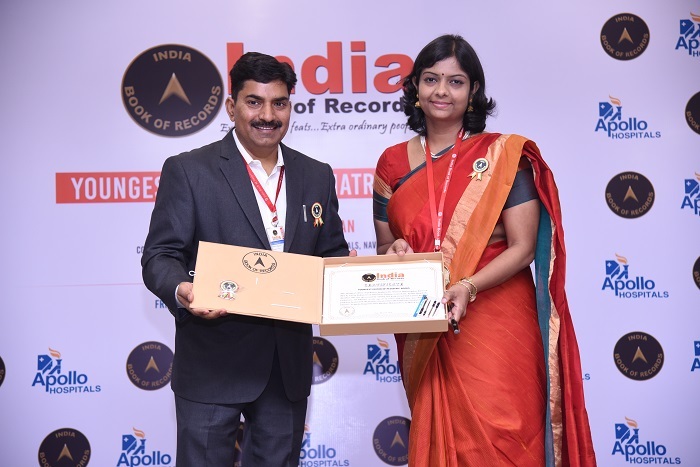 The felicitation ceremony by the India Book of Records was held at Apollo Hospitals, Navi Mumbai. The India Book of Records, affiliated to the Asia Book of Records is an annual periodical that documents both human and natural achievements. Dr. Dhanya Dharmapalan, aged 32, is a Consulting pediatrician and infectious disease specialist currently practicing at Apollo Hospitals Navi Mumbai and will feature in the India Book of Records – 2020 edition for her achievement. It was in 1983 that Dr. Prathap Reddy made a pioneering endeavor by launching India’s first corporate hospital - Apollo Hospitals in Chennai. Over the years Apollo Hospitals has established itself as home to the largest cardiac practice in India with over 160,000 cardiac surgeries. Apollo Hospitals is also the world’s largest private cancer care provider and runs the world’s leading solid organ transplant program. As Asia’s largest and most trusted healthcare group, its presence includes over 10,000 beds across 71 Hospitals, 3000 Pharmacies, over 90 Primary Care and Diagnostic Clinics, 110 plus Telemedicine Centres and 80 plus Apollo Munich Insurance branches spanning the length and breadth of the Country. As an integrated healthcare service provider with Health Insurance services, Global Projects Consultancy capability, over 15 medical education centres and a Research Foundation with a focus on global Clinical Trials, epidemiological studies, stem cell & genetic research Apollo Hospitals has been at the forefront of new medical breakthroughs with the most recent investment being that of commissioning the first Proton Therapy Center across Asia, Africa, and Australia in Chennai, India. Every four days, the Apollo Hospitals Group touches a million lives, in its mission to bring healthcare of International standards within reach of every individual. In a rare honor, the Government of India issued a commemorative stamp in recognition of Apollo's contribution, the first for a healthcare organization. Apollo Hospitals Chairman, Dr. Prathap C Reddy, was conferred with the prestigious Padma Vibhushan in 2010. For more than 30 years, the Apollo Hospitals Group has continuously excelled and maintained leadership in medical innovation, world-class clinical services, and cutting-edge technology. Our hospitals are consistently ranked amongst the best hospitals globally for advanced medical services and research.